Dena Burnett has made a discovery about knee pain that one day could lead to new treatments. Burnett, a University of Saskatchewan PhD student in biomedical engineering, has found that in people living with osteoarthritis, those with intense knee pain have approximately 30 per cent lower bone density at the knee than those with less pain. Burnett studies the connection between bone density and pain in this disease, an aspect largely overlooked by previous research. Called "the wear and tear of joints," osteoarthritis causes people, especially the elderly, to feel increasing pain due to damage to the knee bone and cartilage, the rubbery tissue that cushions the joints. Causes of the disease are unknown. Treatments are limited to painkillers and surgical knee replacements in the most severe cases. The connection Burnett has discovered between pain and bone density suggests that osteoarthritis-related pain could be caused by lower bone density in the joints. 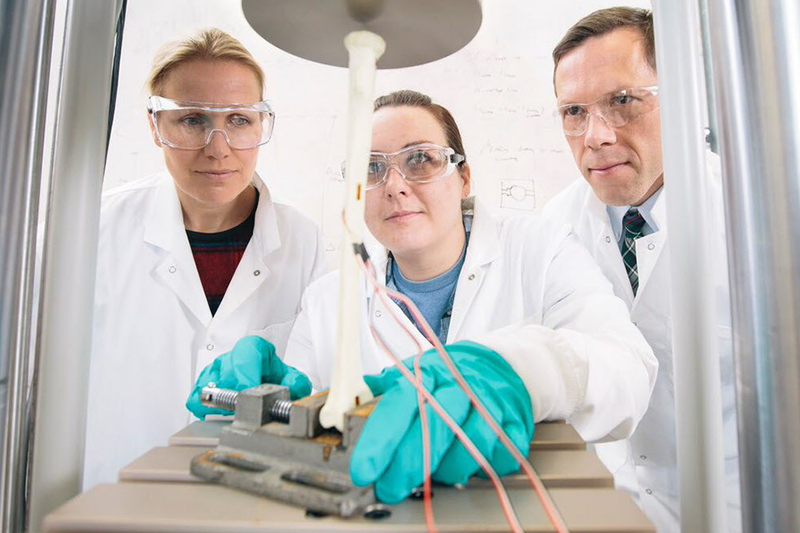 "Bone-modifying drugs could be used one day to increase patients' bone and help alleviate the pain," said mechanical engineering professor James Johnston, who co-supervises Burnett with kinesiology professor Saija Kontulainen. But Johnston cautions that a larger study is needed into whether low bone density is actually an underlying cause of osteoarthritic pain. Previous research into the cause of pain has looked at the damage to the cartilage using techniques such as X-rays and magnetic resonance imaging (MRI) or using samples from cadavers. Burnett looked not at just the cartilage, but at the bone found deeper under it — the subchondral bone. She used a non-invasive method—a three-dimensional computer tool developed by Johnston—to measure the quantity of bone in patients. She compared computed tomography (CT) bone images of people with healthy bones and with those of people at late stages of osteoarthritis. "These bones are like the foundations of a house, and cartilage is like the walls," she said. "When you buy a new house, you don't only check the walls. You check that the foundations are not shaky too." Burnett's findings suggest that in people with low bone density, bone is likely less stiff, squishes more and breaks more easily. This discovery has an important consequence for treatments. Usually doctors wait until the pain is excruciating before replacing joints with metal implants. "Our results suggest that waiting too long for knee surgery could decrease the success of the surgery because patients have lower bone density," Johnston said. In collaboration with Stanford University, Burnett's next research step is to use CT images of more than 5,000 patients across the United States to study bone at various stages of the disease. Her research is funded by the U of S, the federal agency NSERC and the Canadian Arthritis Network.